Salon name, address and phone number. Have your profile published to salonspy, and start receiving reviews. We generate reviews automatically by integrating with your salon software system. If we don't already partner with yours, we can still set the system up to work. Reply to / dispute any reviews - this promotes client engagement & shows the world how seriously you take customer feedback. The ultimate dashboard of your salons feedback - break down the reviews into date, month, rating or even by team member. Activate our popular Recommend a Friend feature - have your clients share referral vouchers on Facebook, Email and WhatsApp. Google "Reviews from the Web"
Add your online booking link to your salonspy profile and take full advantage of our hair & beauty traffic. Add a list of team members & each time you get a new review we will ask the client which team member served them, then you can view all those reviews seperately in the admin section - great for performance management. Internal, private feedback between the client and salon owner - if you get marked down for anything, PF will ask them exactly why & what went wrong. These comments are not displayed publicly. Annual recognition for your salons' overall performance. Have a salonspy reviews feed through to your website, that automatically updates. Collate and oversee multiple salons with our Group Administrator account. Whether you have two or a hundred salons you'll be able to see their collective performance and display your salons on a single page. This 5 minute video will bring our Pro Plan to life and show exactly how salonspy will add amazing value to your business. With our performance dashboard, you will be able to monitor feedback for each team member. You'll also be able to add online bookings to your page and as an extra treat, salon and staff members will be entered into the annual salonspy 'stylist of the year'. Our platform is designed to rank well in Google - if you have reviews, we will get them ranked in no time. Have your good reviews found, more often. We proudly work with lots of leading industry names and have achieved amazing results for everyone from small independents, to the largest chain in the country. Yes. All reviews that are submitted are human-moderated by our in-house team before they're published and visible to the public. Will my salon's reviews show up in search engines (i.e. Google)? Absolutely. 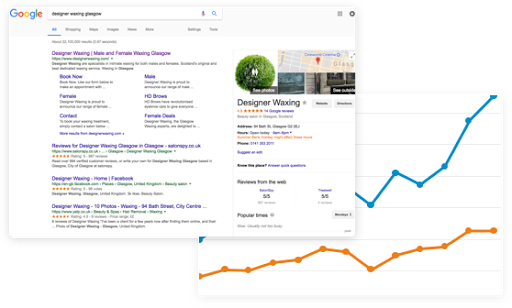 Your salon's listing is fully optimised to show in Google, allowing potential clients in your area to find your reviews. Bad reviews unfortunately do happen. When receiving contructive feedback it is an opportunity to rectify and rescind the complaint. Salon Owners can use the Review Management Tools to respond to reviews whether good or bad. 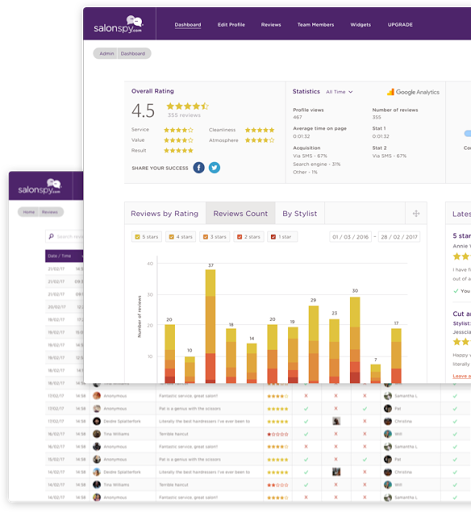 As an impartial feedback platform, salonspy does not allow the omission of negative reviews. How are negative reviews moderated by salonspy? We have a careful code of ethics that ensures all reviews are family-friendly content with profanity stricly censored. We do not allow personal attacks and allow stylist/therapist's names to appear in negative reviews. What if I think the review is fake? If you believe the review is fake, please use the 'Dispute' option within the review management tools. We will investigate this further. Can I share the reviews on my social media? Yes, we encourage it. Each review can be shared to Facebook / Twitter from the salon control panel. Responding to reviews is a great way to show the world that you take client engagement seriously. We advise salons to respond to all reviews, good or bad, and address them each individually. A copy and paste response doesn't come across well. Can I offer my clients an incentive to leave a positive review? No. You can encourage your clients to leave you feedback, but offering a reward for a positive review is against our fair practice policy. How can I register my business on salonspy? Can I link the reviews to my own website? Yes. Within your control panel you will see a 'Widget' section. If you require a bespoke widget, please contact us for costs. I use salon software, how do I integrate? salonspy integrates with most platforms. Visit the plans page for more information. Is salonspy available in my country? Possibly, it depends where you are located. It's best to get in touch and we can be a little more specific as we're currently planning to roll our platform out to other countries. Send us a message in the form below and we will aim to respond within 48 hours.